The Purity of the Turf is kind of a "bucket list" moment for Ethan Iverson, who has always wanted to make a record with famous bassist Ron Carter. 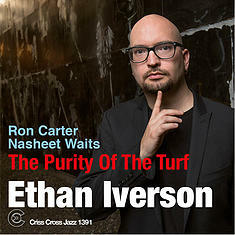 Iverson, pianist of the famous trio " The Bad Plus ", chose drummer Nasheet Waits to fill out the trio, because Waits represents the avant-garde as well as swing. Criss Cross records are level playing field, with everyone recording in the same studio in a single day: Thus the sporting title, "The Purity of the Turf". The repertoire is mostly originals and jazz classics. A surprise highlight is the solo piano tribute to the late Paul Bley, " So Hard it Hurts " by Annette Peacock.